Just off the coast of mainland Singapore is Pulau Ubin, a boomerang shaped island, meaning ‘Granite Island’. This was once home to thousands of settlers dependent on granite quarrying. Though abandoned since the 1970s and reclaimed by nature, these quarries remain a picturesque relic of the past. Now, the few remaining villagers subsist on farming and fishing. The fact that, this is the one last bit of the heavily urbanised Singapore that still retains its rustic village ways is what makes this a popular day trip destination. You can go exploring this quiet island on foot or by cycling along the many bike trails. Stopping along the way for a birds eye view of the luxuriant tree canopy and flourishing bird life from the viewing tower. A cape, surrounded by wetlands rich in bio-diversity, lies at the tip of Pulau Ubin. This is Chek Jawa and its popularity precedes it. So much so that, we were not the only ‘tourists’ who had packed a picnic lunch to eat at the lookout-jetty on the boardwalk. The Coastal Boardwalk runs along the coast for almost a kilometer and leads you through the mangroves to the jetty right in the middle of the Straits of Johor. Though made of concrete, this boardwalk is built to look like wood so the effect is not jarring but goes well with the unspoilt feel of the island. 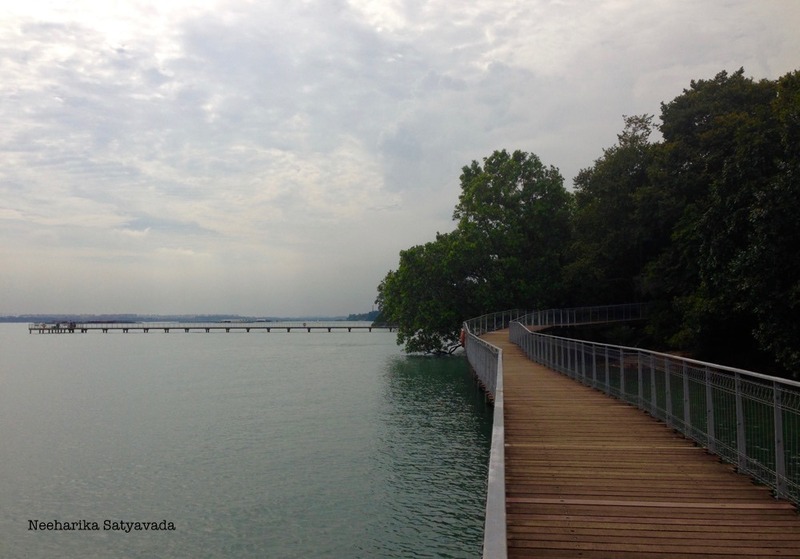 The Island of Pulau Ubin boasts of a variety of ecosystems in and as one. Coastal Forests, Mangroves, Seagrass Lagoons, Tidal Flats – both mud & sand and Coral rubbles. Where, even rocky shores and sandy beaches co-exist. Mangroves – Protectors of shorelines. More than even the ‘exploring on a cycle’, it was the walking through these shady mangroves that I enjoyed doing the most on this island. May be it was my coming from the country of the Sundarbans. Or my counting The Hungry Tide and Midnights Children amongst my favourite books. I admit that ‘mangroves’ did hold a certain fascination for me. Even before I ever saw them for real. But the experience of walking through a mangrove forest, where the sun-rays play hide and seek with you, as you hear and feel the distant breeze from the surrounding sea, definitely heightened that fascination. Found in calm waters of low salinity, the Nipah Palm is the only true mangrove palm. Like the other palms, it is tapped for its sap that is fermented to make alcohol. While its mature fronds are used for thatching roofs & are also woven into mats & baskets. Locally though, its most recognizable use is its edible seed. Only a short boat ride away, this island has a lot to offer and is totally worth the time!